A major scheme to reduce flood risk to thousands of homes and businesses on the Lincolnshire coast has been completed ahead of schedule. Lincshore – the Environment Agency’s multi-million pound flagship scheme – finished on Friday 23 May. This year’s campaign began on 17 April following on from work to rebuild the sand dunes north of Mablethorpe that were badly damaged by the December tidal surge. Once again, we have been using the dredger Breughel, one of the biggest the project team has ever used. Breughel’s large capacity has meant we have been able to complete the scheme quickly well ahead of the summer tourist season. During Lincshore we build up beach levels to replace sand lost to the sea over winter. It is vital to reduce flood risk on the coast and also benefits tourism by maintaining the beaches – without it there would be little sand. As always, we would like to thank people living and working along the coast for their patience during this year’s scheme. Without Lincshore, tens of thousands of homes would be at severe risk of flooding, along with commercial and industrial properties. A number of important environmental sites would also be affected. 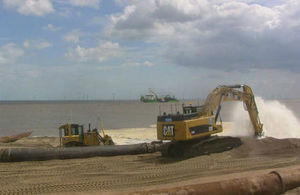 The scheme works by increasing the level of the beach to reduce the risk of waves reaching and over-topping the main defences. It protects the clay foreshore against further erosion and prevents rapid deterioration of the defences. This year’s 5 week campaign has seen around 520,000m³ cubic metres of sand pumped from licensed off-shore sites onto beaches along a 20km stretch of the Lincolnshire coastline. Beaches that have been nourished include Boygrift, Trusthorpe and Mablethorpe, Sutton on Sea, Chapel Six Marshes, Ingoldmells, Trunch Lane, Huttoft and Moggs Eye. Lincshore first began in 1994 and covers beaches from Mablethorpe to Skegness. The scheme maintains protection against a 1 in 200 chance in any 1 year of tidal flood (0.5%) for 30,000 properties and 35,000 hectares of land.